I just got off the phone from Jode, who happened to be standing in the line at the post office to send her finished squares. She was reading the blog last night thinking Jen and Kate were very organised till she came across the due date. A sickie was chucked, the new machine came out of the box and away she went. With some feed dog issues, Jode reckons the first couple look like she was sewing them drunk – on the back anyway (hence the pic!). Never fear though, nobody will see the back cause it'll be sewn inside the quilt. 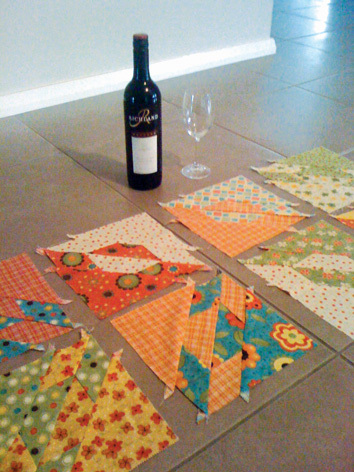 So, not only has Jode managed to find her way around a different sewing machine model, but the squares are complete and on their way to Marrickville. Yay Jode! Well done Jode!!! 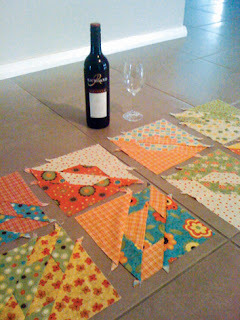 You have done a great job - the squares look great in the photo - love the red wine ( I hope you finished that off afterwards - I would have loved to have shared the day sewing with you:)). I will try and call tonight. We hope Adam enjoyed his birthday!